You are here: Home / Blog / General / How much do carpentry services charge to build a carport? Carports are not as expensive as building a garage and many carpentry services are able to build you a high quality carport that matches your external decor for a very reasonable cost. 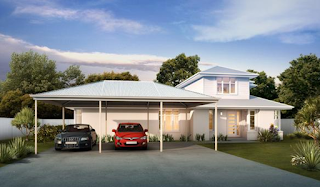 The open construction of a carport often suits home owners more than an enclosed garage, particularly in the warmer climate of Brisbane. Of course you can build a carport that costs as much as a brick garage, but in general your costs will be lower for a carport than a garage. When you are in the market for experienced carpentry services, make sure to ask them whether they will build a carport that comes in a kit form for you or whether they will design and build you one from scratch. It is always good to know your options with any carpentry services in Brisbane, because if you want a carport that is perfectly matched to your home, then you might need to have it custom designed. You can purchase a DIY carport in kit form and ask your local carpentry services to build it for you, but remember that you will need to organise a slab and any council permits you might need for the carport as well. A single timber carport might set you back around $3000, whilst a double timber carport might come in at $5000. These are only estimates of course, and don’t include the cost of the slab or any council fees. Another option, apart from building the carport yourself or engaging carpentry services to do this for you is to hire a builder. Many local builders are happy to build carports and they will bring their own team of tradies with them as well. Even better, they will arrange the slab for your carport and organise the council permits (if necessary) for you as well. Hiring a builder rather than searching through all the carpentry services available in your area is the best option, because you won’t need to do anything yourself. Builders however, do cost more than carpentry services alone, but they take all of the stress away from your build and manage the entire project for you – so they are worth the extra dollars it might cost.